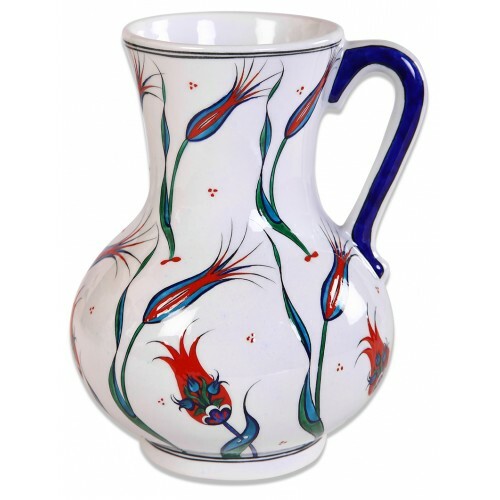 İznik porcelain pitcher was designed and hand-made by the artist Mehmet Gürsoy who has been interpreting the original 16th century İznik patterns and bringing them into the present. Mehmet Gürsoy is one of the artists who revived particularly the Turkish porcelain art which reached a peak in the 16th century whereas sank into oblivion in the 17th century, who was considered as a “heritage carrier” by UNESCO and was announced as the “Living Human Treasure”. Dimensions: Height 21 cm, Diameter 14 cm. 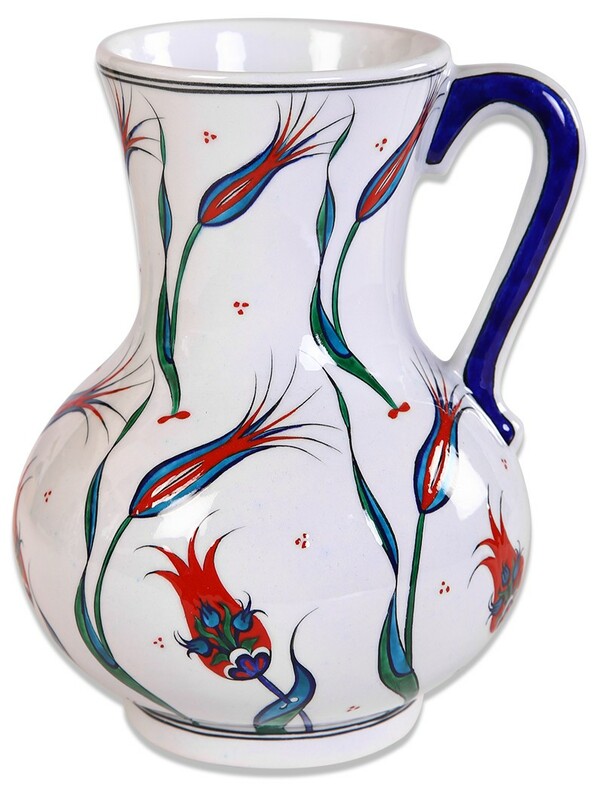 Mehmet Gürsoy, born in 1950, is a world famous ceramic artist who has revived the ceramic art of Iznik, lost in the 17th century and who has carried it further with his own innovations. Gursoy, a student of Prof. Muhsin Demironat of the Istanbul Fine Arts Academy, has practiced the ceramic arts for 35 years and is known for his contribution to the rebirth of Iznik’s art. The artist receive the first prize for a vase and a dish, and the second prize for a tile panel at the first International ceramic congress in 1986. Since then Gürsoy is a successful teacher, bringing many new students to the art at the Dumlupınar University. His work has been featured in many national and international exhibitions, and he has been invited to demonstrate atmany festivals of art. According to the artist, ceramic provide music to the eyes. Tulips, roses, hyacinths and carnations are like musical notes and precious stones shining beneath a clear, shimmering glaze. Mehmet Gürsoy was awarded the ‘Living Treasure’ prize by UNESCO in 2010.